The vast majority of the books and other items in the Dogcrazy Collection were acquired in the 1970s and '80s. Since then, I really haven't set out to make additional acquisitions. Oh, if I saw an intriguing item at an antique shop or a thrift store I bought it. But, essentially, the Collection was frozen in pre-1990 time. There is one particular segment of the Collection that has grown in recent years: prints of retrievers. Most of these date from the 1980s and ‘90s. I’ve acquired these from my friend Walt. Since these prints are such an outlier from the rest of the collection, I thought you might want to know a little more about Walt and his collection. Or, maybe it’s just a great excuse to let me write about someone that’s been important to me. About eight years ago, I had just finished a ghost-writing assignment. Writing is hard work and it’s really a solitary endeavor. You spend lots of time sitting in front of a computer pounding away at the keys. If you do much writing, you don’t really get out to socialize. Other than my husband and son, I don’t see people very often. I’m usually relegated to staying in touch with old friends via email. (Oh, thank heaven for email!) Most of the time my anti-social status doesn’t bother me, but for some reason all those years ago, I was craving human contact. I saw an announcement in the local paper that a writer’s group would be meeting in the coffee shop section of a nearby bookstore. Why not go, I thought. If the writer’s group proved to be a dud, I could always grab a book, a cup of coffee and still have a pleasant morning. People were already assembled at the tables when I arrived. I ordered coffee, a couple of slices of pecan coffee cake and sat down in the nearest available seat. I shared a little table with an older man with salt and pepper hair. He wore gray pants with a crisp crease and a white shirt that was so new it still bore the lines where it had been folded in its package. His black shoes were a bit scuffed and could have used a good polish. We nodded to each other as the meeting began. I don’t know what I expected. I thought perhaps that writers would read from examples of their latest work and invite feedback. Those assembled turned out to be unpublished writers who moaned and bellyached ad infinitum about the plight of Southern writers. The consensus was that Southern writers were unappreciated and discriminated against by the publishing industry. Really? I was uncomfortable with the discussion and growing angrier by the minute. I noticed that it was having a similar effect on my tablemate. He kept shifting position and clenching his jaw. Over many cups of coffee and a whole darn coffee cake I learned that Walt owned three dogs: a black Labrador Retriever, a yellow Lab and a Golden Retriever. He bought his first Lab in 1962 with money he earned bagging groceries. When he went away to college, he was forced to live off campus since dogs weren’t allowed in the dorms. Right after he graduated, he was involved in an auto accident and severely injured. After he got out of the hospital, he spent six months in bed, his Lab lying by his side the whole time. In fact, he credited that dog with hastening his recovery since he felt guilty at not being able to walk the Lab. The dog stayed by him, step by slow agonizing step, providing his broad back for stability, as Walt learned to walk normally again. There’s not a single day since that Walt has been without a Lab. In the early 1970s, Walt bought his first Golden Retriever and he’s owned one of that breed ever since, too. Walt showed his first Golden a few times and, back when he was living in Wisconsin, he regularly hunted with his dogs. He never married, his parents died long ago and he doesn’t have much family. For Walt, the succession of Labs and Goldens had been the constants throughout his life. Walt graduated college with a degree in journalism. He worked for a short time as a newspaperman, but opted for better pay in management at a large company. Lately, Walt had been toying with the idea of writing a mystery. Ostensibly, that’s what drew him to the writer’s group. Between you and me, I think he came to the group for the same reason that I did: loneliness. After meeting at the writer’s group and discovering that we had a lot in common, Walt and I started a new tradition that lasted for years. We met at nine AM every Wednesday morning for coffee at a nearby café. It’s a small place with an outdoor sidewalk seating area, surrounded by a low metal fence. Walt brought his dogs along and they lay down outside the fence next to our table. They are well-behaved and quiet except for the occasional whine prompting us to give them a bit of whatever we we’re eating. Hey, it’s as close as we can get to those scenes you see from Paris where people lounge with their dogs beneath the tables. Walt left behind the rigors of Wisconsin winters that he found difficult to cope with as he aged. He’s not a gregarious man and he hasn’t made many friends since he moved to the South. Dogs, books and movies are his constant companions. He seldom goes anywhere without his dogs. He reads everything. For the past several years, he’s read one to three books a week. Like me, he’s a big mystery fan and he has the same approach that I do. When he discovers a new mystery writer, he starts with their first book and reads through to their most recent one. He’s been on a biography/autobiography binge for the past couple of years. And, like me, he’s become a passionate reader of American history. While I opt for the Revolutionary period, Walt is fascinated by the Civil War. Walt is also a great movie buff. Years ago, when those first lists of the 100 greatest movies were released, Walt started at number one, cranked up his VCR and watched all the rest. Now, one of his few indulgences is a full suite of cable channels, everything from HBO, to Showtime, to Cinemax, etc., etc. I love hearing his reviews of movies. I love Walt’s house. It started out as a typical tract house, but Walt had it remodeled when he bought it so that it now resembles a cozy bungalow with large rooms. I got quite a shock on that first visit when I realized that Walt and I had another thing in common: we are both collectors. Somehow, it had never come up in our many discussions. With the exception of the big screen TV, the walls of Walt’s house are filled with either bookshelves or great doggy artwork. Walt has an extensive collection of books on retrievers. Like me, he collects everything from very rare books to newer editions. 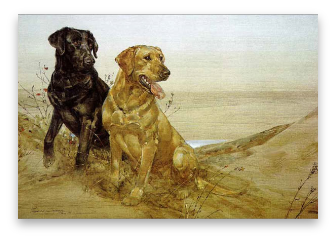 But, the surprise for me, on that first visit, was Walt’s collection of retriever artwork. Here’s the best way to describe it: jaw-dropping. Hanging over the fireplace was a large oil painting by Alexander Pope, dating to the 1890s. A black dog, reclining on a porch, stares out at you. He looks like a really heavy-bodied Labrador Retriever. The painting has been handed down the generations in Walt’s family. It’s proof, Walt says, that he was predestined to be a Labrador owner. As I toured Walt’s house, I found other treasures. A large painting of a black Labrador done in oil by Reuben Ward Binks presided over the dining room. In his study was an oil of a pair of English Setters by Edmund Osthaus. I walked slowly around the library where I noted an original charcoal done by Morgan Dennis, as well as etchings by Lucy Dawson and Maud Earl. Hanging over Walt’s bed was an oil painting of a Labrador with a duck in his mouth by Edwin Megargee. There was even an etching of two Labs by Marguerite Kirmse in the bathroom. Walt had not confined himself to old paintings and prints, though. He had collected many, many prints by contemporary artists, most done in the 1980s and ‘90s. There’s a long gallery-like room that runs the width of Walt’s house. A double row of retriever prints hangs from the walls, creating an overwhelming sensation. I hadn’t realized that so many truly gifted artists had been attracted to Labrador and Golden Retrievers in the years since they skyrocketed to popularity. One can’t help but think that these prints are the high-priced collectibles of the future. Sadly, the past couple of years have not been kind to Walt. He’s in his late 70s now, frailer than when we first met and he has more health problems. The company he worked so many years for went belly-up and he lost his pension and his health benefits. Walt thought he had everything worked out so he could retire in comfort. Thank goodness for Social Security and Medicare. The Binks, the Osthaus, the Morgan and the Megargee are all gone now, but at least Walt’s house is free and clear. I imagine that the Kirmse and the Earl will go soon. I just hope Walt’s able to hang on to the Pope. The biggest loss for Walt, though, happened last year when his 14 year old yellow Lab, Katie, died in her sleep. I worry about Walt and try to help out. We’ve started swapping the weekly café outings for mornings on his brick patio. He makes the coffee and I bring the coffee cake or a sweet bread. I usually bring along a big pan of lasagna or a big pot of soup, too, so he will have something homemade to eat during the week. I bring treats for the dogs and take them to low cost vaccination clinics. Over the past year, I’ve been buying the modern prints from Walt’s collection. I think he was embarrassed at first, but I’ve finally convinced him that I consider it a privilege to be able to purchase them. I must admit, I’ve become so fond of them that it’s going to be difficult for me to sell them, too. So, that’s the story of how so many prints from the 1980s and ‘90s became part of the Dogcrazy Collection. For me, they will always be a reminder of a good friend and his phenomenal collection. I just want anyone who buys these prints to know that they come with an enduring legacy of devotion to the breeds. They were once owned and loved by a man who has owned Labs for more than 50 years and Goldens for more than 40 years. When you purchase them, you’re helping out an old retriever man. Here’s to you, Walt. Flash! Walt and I haven’t been meeting regularly lately. Not too long ago, Walt’s Golden Retriever, Lucy, escaped from the house and a frantic search ensued. Walt went door to door. Finally, he knocked on a door a few blocks away and Lucy greeted him. A gray-haired “widow lady” had taken her in and she proceeded to give Walt a tongue-lashing for allowing the dog to get away. Short story: Walt, now close to 80 years old, has fallen in love for the very first time. By the time you read this, he will probably be married. And, it was a dog that brought them together. Will wonders never cease?